Just ran across the Web site “Stuff Journalists Like.” Written by, I assume, a couple of out-of-work journalists from Colorado, the list is spot-on accurate and funny! But it’s a nice escape from the news about journalists recently, and I highly recommend it anytime you need a good laugh. This item caught my eye while getting caught up on things over the holiday. GateHouse Media is suing New York Times Co., the owners of the Boston Globe, for using Gatehouse content verbatim on the Globe’s “Wicked Local” community news site. GateHouse claims such use is a violation of copyright laws. NYT says what it is doing is not unlike what many others are already doing on community news sites. This is a battle that will need to be closely watched next year. If GateHouse comes out victorious, it could have a chilling … no, make that ice age … effect on the further development of community news sites. And that chill could very well be felt from small bloggers to the Huffington Post … and even Google and Yahoo. The question of whether content is proprietary has been the 800-pound gorilla in the community news room. As bloggers, aggregators and new products (like the Tribune Co. “breaking news” site) have been built on borrowing from other sources, those who have been borrowed from have, for the most part, looked the other way. And with newspapers forced to cut back on its own resources, it is turning to linking to others … including competing sites … to provide information it can no longer obtain on its own. GateHouse has decided to push the issue. If the courts rule this as an infringement of copyright laws, it will be interesting to see what transpires. Will this create a need for written permission to link to content? Will it create a new cottage industry for copyright lawyers? Or will it drive a knife through smaller, upstart sites as the big media companies suddenly say “mine” and don’t share? Ironically, GateHouse has prided itself in being a leader in the transition into electronic media and community journalism. It will be interesting to see if it is the company that, effectively, kills off the new evolution. * Here’s a wonderfully reflective piece on Chicago journalism. Makes me want to have a shot and a beer in honor of Mike Royko. Paul Zilly’s name will probably never be engraved in the Newseum. His name probably won’t be remembered among journalistic heavyweights like Pulitzer, Hearst, Graham, or McCormick. But Paul embodied the meaning of community journalism, and for the folks in Crystal Lake, Ill., Paul was every bit a newspaperman as those heavyweights. Paul recently died at age of 83. As publisher of the Crystal Lake Herald … the predecessor to today’s Northwest Herald … Paul was the newspaper, and the newspaper was the community. I had the honor to work for him right before he retired in 1983, shortly after the company that owned the paper was sold to Shaw Media. A quiet and affable man, Paul had a wonderful sense of humor and strong love for his community. It was a love that I, as a way-too-young managing editor, learned to appreciate and respect. Paul’s first piece of advice to me was “don’t make waves.” But I didn’t listen to him and quickly found myself challenged by some of the town’s more influential people. But Paul always stood beside me and defended my decisions and actions. Later, when the fires subsided, he’d give me a quick lesson on diplomacy. Those lessons were valuable the next time we’d cross swords with the town leaders. Paul didn’t want us to make waves, but I think he enjoyed it when we rocked the boat. Most of all, Paul taught me the value of community journalism and its impact on readers. How Little League games had the same importance to the community as what went on in Springfield and Washington. How people and what makes them unique is as important as council meetings. He taught me how to use the paper to celebrate great things. How to mourn a loss. How to listen to what readers have to say, and how to give them what they’re looking for in a newspaper. Shortly after Paul announced his retirement (just after Shaw took over the paper … and to this day I still believe he didn’t want to go), I was working a booth at a local business expo. Every one who visited that booth had a story about Paul. Some loved him and the paper. Others hated him and the paper. But they all were sad to see him leave, because they all knew Paul loved the paper, and he loved Crystal Lake. Paul taught me a lot in the short time I worked with him, and he continues to be an inspiration. Paul knew the newspaper was the heart of its community. A good newspaper is read and embraced by its community. Readers may love it, or they may hate it, but they read it every day because they knew those pages reflected the community’s soul. Paul Zilly was the embodiment of all things Crystal Lake. And the Crystal Lake Herald reflected that. On top of that, he was also a great guy. Thanks for the life lessons and the memories, Paul. The news about newspapers certainly hasn’t been bright this holiday season. Announcements of more layoffs, cutbacks in service and companies going bankrupt have tarnished the spirit for most of us who care about the institution of journalism. 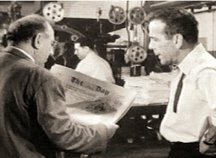 For those of you who are unfamiliar with it (and I strongly encourage you to get familiar with it, if you can find a copy), “Deadline U.S.A.” is a 1952 film starring Humphrey Bogart as Ed Hutcheson, the editor of the mythical New York Day newspaper. The film starts with the the newspaper staff finding out … through an alert over the wires … that the Day’s owners are selling to a rival, who will shut the paper down. While the specter of the Day’s demise hangs overhead, a reporter finds a powerful union chief had a hand in the murder of a young woman. Bogey spends most of the movie working with his staff to seal the expose, while fighting with the owner’s family to keep the Day in business. The film ends as the paper is ready to print its final edition, The union chief threatens Bogey over the phone if the story runs. Bogey, in the pressroom, speaks to him as the presses begin rolling. “What? I can’t hear you. What’s that noise?” the union boss asks. “That’s the press, baby. The press. And there’s nothing you can do about it. Nothing!” Bogey responds. As the Day breathed its last gasp, Bogey and his crew go out with the biggest expose in the city. In essence, “Deadline U.S.A.” is the “It’s A Wonderful Life” for newspaper people. Fast forward to 2008. In Chicago, the Tribune Company is in bankruptcy, yet the flagship paper continues to churn out investigative stories and, recently, intensely cover the arrest of the governor of Illinois on charges of conspiracy. Its rival, the Sun-Times, which has been in economic intensive care for the past several years, continues to be a dominant player in the Chicago news. In Detroit, newspapers teetering on bankruptcy are cutting back on staff and eliminating home delivery on several days, yet the reporters and editors there continue to investigate and report on the corruption case surrounding the city’s former mayor. Similar scenarios are playing out in Denver, Miami, Seattle, San Jose and many other cities across the nation. In this tenuous time, newsrooms continue to pursue the mission of great journalism. Just like the reporters and editors of the Day, today’s journalists are not losing focus of the core mission Hutcheson espoused: To inform, investigate, expose. To be a watchdog and a servant for the public good. And as long as we remember why we went into this profession … to be watchdog and servant for the public good … great journalism will survive. The presses may eventually fall silent, but great journalism will continue as long as there are people who are dedicated and loyal to the mission. Because THAT is the press, baby. And there’s nothing they can do about it. If those of us in the Illinois media acted this way sooner with Gov. Blagojevich, would we all be in the situation we’re in today? The Tribune Co. files for bankruptcy. McClatchy shops for buyers for flagship Miami Herald. Scripps puts the Rocky Mountain News on the block. Is this our version of the Big 3? And … in all seriousness … on the face of it, who’d want to bail out this industry? Could Dean Singleton become the Darth Vader of Denver? With E.W. Scripps’ announcement that the Rocky Mountain News is for sale, it’s a possibility. Singleton, who is president of the parent company of the Rocky’s rival Denver News, could potentially be a likely suitors for the Rocky. Alan Mutter even suggests that Singleton’s MediaNews Group could be the most likely buyer. Singleton hasn’t said if he is interested in purchasing the Rocky. But he did say in the Post that he didn’t think Scripps would find a buyer. Given the current economic climate, I also doubt there will be much interest in the Rocky, despite its long history of being the scrappy tabloid that reflected the attitude of the pioneers that built the city at the foot of the Rocky Mountains. But, as Sam Zell pointed out recently, investors can’t cash in on Pulitzer prizes. And, given the Post’s dominance in the market, I doubt anyone outside the industry would be interested in buying a struggling newspaper in a competitive market at a time when those in the market are all struggling for survival. So, at first blush, MediaNews would seem like the ideal buyer. Considering the two papers have a JOA that combines a number of functions in circulation and advertising, and the papers share space in the same downtown building, there would be little else to consolidate. So why would MediaNews want two newspapers in the same market? To answer that, we need to look at Dallas in 1991. Dallas was a two-newspaper town, dominated by the Belo Corp.’s Dallas Morning News and an afternoon competitor, the Dallas Times Herald. 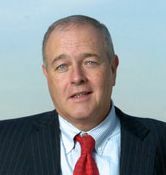 The Times Herald, like the Rocky, had a reputation of being the scrappy underdog that continually nipped at the heels of the more conservative News. Its stable included columnists like Molly Ivins, Skip Bayless and Joe Bob Briggs. A young reporter named Jim Lehrer covered the Kennedy assassination for the paper. It had 3 Pulitzers on its trophy shelf, including one for the infamous photo of Jack Ruby killing Lee Harvey Oswald. In the late 80’s, a young entrepreneur named William Dean Singleton bought the paper from Times Mirror for a song, and after a few years of extensive cutbacks in staff and resources, he sold the paper to Belo in 1991. The next day, Belo shut down the Times Herald, thereby eliminating the News’ major competition in Dallas. Back to today. Singleton is now in the catbird seat to give the Denver Post sole possession of the market. MediaNews Group could easily develop a package to buy the Rocky and, with a single slash from his corporate lightsabre, Singleton could eliminate the Rocky, absorbing what assets it has left into the Post’s operation. If this does play out, it’d a win-win situation for Singleton and MediaNews Group. But It’d also be a big loss for Denver and the newspaper industry, as the Rocky would be added to the list of great metropolitan newspapers that have bitten the dust over the past two decades. I stress that this is only one of many scenarios. A buyer could come through for the Rocky … maybe a noble billionaire as Rocky columnist Mike Littwin hopes. But that scenario … especially in light of the N.Y. Time’s revelation that McClatchy is trying to find a buyer for the Miami Herald … is the least likely out there. Or, Scripps may not find a deal to its liking and just close up shop on its own, which would still give Singleton a monopoly in Denver without him moving a finger. But if Singleton does become a player in the Rocky’s sale, the irony would be significant. UPDATE DEC. 15, 9:10 p.m.: OK, with MediaNews now teetering on the edge of bankruptcy, I now doubt this scenario will play through. But, I wouldn’t be surprised to see Scripps and MediaNews “merge” the two organizations, eliminating one nameplate or maybe making one online only. The question would only be: Who will be willing to absorb all that debt?